Pot it no more than about 3 inches deep for rooted cuttings that are under 15 inches. Larger ones may need 4 inches average depth–really big ones– more. Often times there will be a “tan line” on the trunk showing the depth at which it was potted before being cleaned and sent to you. You can use this as a clue of how deep to pot. Water in thoroughly. Water again only when dry. You might have noticed when your plant arrives, that some roots may have broken in shipping, or you might lose some while potting. These will re-grow in a little while quite easily if you follow these directions carefully. Use a VERY well drained soil mix and avoid mixes heavy in peat moss. 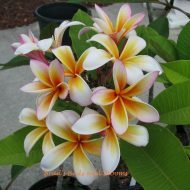 You should use mixes with lots of bark and perlite. If your choices are limited, use Scott’s or Miracle-Gro soil and add plenty of perlite–up to 50%, and, if possible, finely chopped pine bark. On the West Coast many growers add pumice to their mixes with excellent results. Keep your plants in a very warm place–start out with partial sun, and work them up to a half day of full sun over a period of a week or so. Full-sun is actually better if it is the first half of the day, and not the hottest second half of the day. 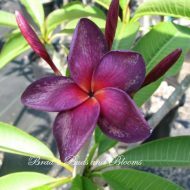 Newly rooted plumeria will appreciate a warm concrete or deck surface to help stimulate root growth. If you notice the lower leaves turning yellow and dropping, or that your stem is a little bit soft, do not worry as this is simply shipping stress and your plant will quickly stabilize. They have been through a lot to get to you, so be nice to them! When leaves emerge, water –like before, only when dry. 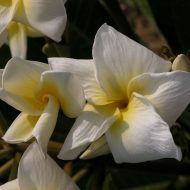 Plumeria do not like “wet feet”. If your plant gets the summer rains and is actively growing, then you don’t need to even think about watering. 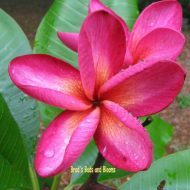 You can use a liquid high phosphorous fertilizer once every 4-5 weeks (look for the high middle number in the formula (15-30-15 for example), for plumeria, such as Miracle-Gro Bloom Booster after your plants have been with you about 3 weeks and had time to settle in. 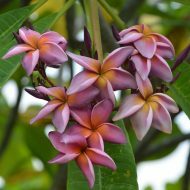 A granular one such as Vigoro Bold Blooms (available nationwide at Home Depot: https://www.homedepot.com/p/Vigoro-Bold-Blooms-3-5-lb-Flowering-Plant-Food-120232/203092420 ) or other time released fertilizer will also do well. Just make sure not to overfeed with high Nitrogen (the first in the set of three numbers) or you will end up with longer, weaker stems and less blooming since Nitrogen primarily encourages leaf growth. Phosphorous (the middle number) encourages roots and flowers; Potash, the third number is for strong stems. Remember though–all things in balance. Our larger trees get fertilized once in spring and once in late summer–that’s it! 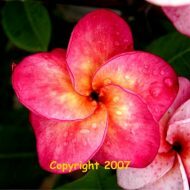 Do NOT prune your plumeria as it grows, unless it gets so big it is out of control. 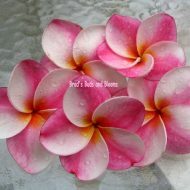 Remember your flowers come from the branch tips. 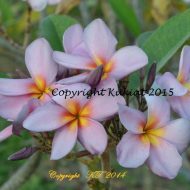 If you remove them all by pruning the plant, you will probably not see flowers until they regrow (which could mean a year without blooms). If you do need to cut branches to shape your tree, remember to treat the cut ends of the branches that are removed with rooting hormone, let these cuttings lie in shade for a week, then pot them up to start new plants. 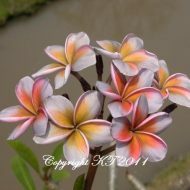 A great “How To” on rooting cuttings can be found at www.plumeria101.com and even has pictures. 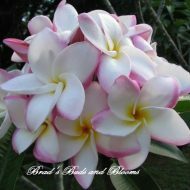 When plumerias drop their leaves in the winter and go into dormancy—watering is something that should only be done if the stems become shriveled or appear and feel too soft. Give a nice drink but do not soak. Remember that the plant has no leaves to take up water and therefore any excess will sit in the soil around the roots–increasing your chances of root and stem rot. 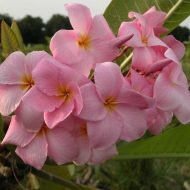 During dormancy, dormant, firm-to-the-touch plumeria can be stored dry with or without soil in a warm, dry place until Spring. Basically, you forget about them and let them sleep. When the weather becomes warm again, gradually introduce to full-sun to avoid sunburn and only water them once, until you see green growth emerging. 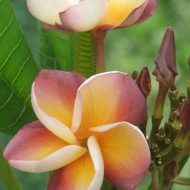 Remember that with Plumeria–LESS IS MORE. Don’t fuss over these plants. They don’t like it. Give them a little space to do their thing and they will surprise you with their resilience and beauty. 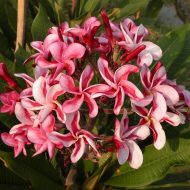 For treatment and prevention of plumeria rust on the leaves use could use a fungicide with Bayleton in it. “Turf Fungicide with Bayleton” or something similar can be used. Locally (Orlando, FL area), this can be found at Lukas Nursery. 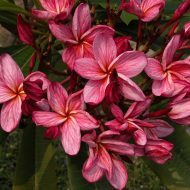 You can also check out the other options available from various nurseries and grower’s supply establishments. One last word on rust, while it is not pretty, in the Fall, it does work with Mother Nature’s cooler weather to defoliate your plant for winter dormancy. 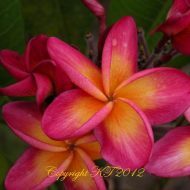 If you have fruit trees and food crops near your plumerias you might want to consider “going natural” with your plants in the Fall and allow the leaves to drop off(remember to gather them up, disposing in sealed plastic bags) instead of spraying toxic chemicals where your food crops, children and pets can also be affected. We discovered in our nursery that since we stopped the spraying, we only get it on certain trees–others seem unaffected. Also, the incidents are less severe. Perhaps Mother Nature is trying to tell us something? So, unless you are a person who must have picture perfect plants all the time, please consider these words, but, you can always experiment to find out what works for you in your area and local conditions.